This month’s Uppercase Box had me completely ‘star struck’! I cannot get over how absolutely gorgeous this month’s Uppercase Box haul is! Everything in it coordinates so well, and I just love every bit! The first thing I want to talk about is the scarf because I am an accessory girl (I know, crazy right?) This beautiful scarf was exclusively printed just for Uppercase, and even better – it’s an infinity scarf. Printed on it is lines from none other than Anne of Green Gables which is such a wonderful classic read. I cannot wait to subtly show off my bookwormness to the world while wearing this! The next item were the nail wraps, inspired by the featured book this month! I’ve never used nail wraps but they look pretty simple and they’re gorgeous so hey, what do I have to lose? Finally the book and all it’s glorious wonder. 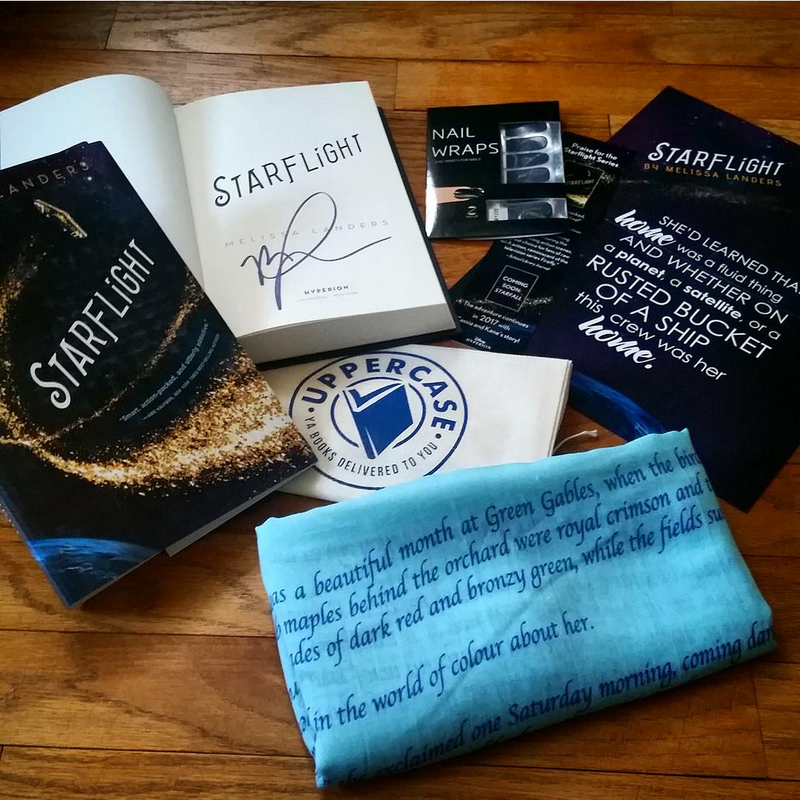 Starflight by Melissa Landers was a highly anticipated read this year, so I’m so excited to not only have a brand new, SIGNED copy of the book, but also for the goodies that include a quote poster and bookmark to match! As usual, I adore this box. Unfortunately, at least for next month, I’ve had to downgrade to just the book exclusive option, so no goodies for me this month! I will be here, reviewing the book choice as usual though so never fear! And fingers crossed I can be back to normal soon. If you’re interested in snagging your own Uppercase Box (which I highly recommend you do), please visit their site and check it out! This was my most favorite box I’ve gotten from them!